Its the Season to be jolly! Who’s ready for the annual get together featuring over 100 artists artwork from around the world takes over Clutter Gallery! Clutter Gallery presents: Gift Wrapped 2017. Featuring many one of a kind releases from 2D to 3D plus those exclusive releases especially for the Clutter annual Gift Wrapped exhibition. 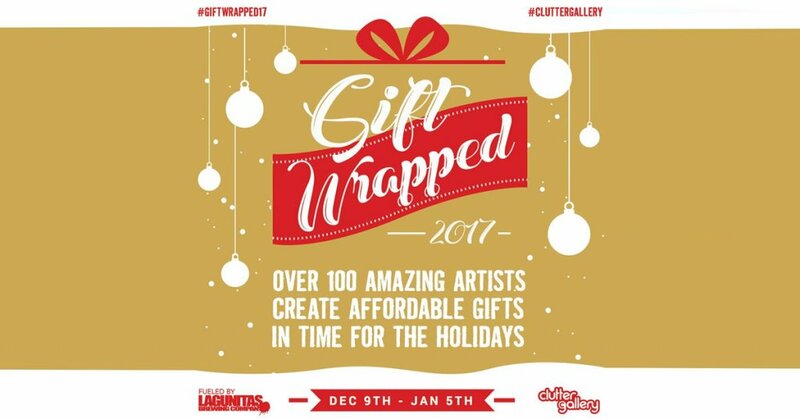 “To celebrate the 5th instalment of our annual Gift Wrapped exhibition we have gathered over 100 amazing artists to bring you affordable art just in time for the holidays!! 2Petalrose • Aica • Ally Burke • Awesome toy • Aya Kakeda • Bakkun • Bleeding Edges • Bog x Squad • Brent Nolasco • Carson Caitin • Cat Atomic • Chima Group • Czee13 • Daniel Fleres • Danny Roldan • David Bishop • Dethchops • Dima Drjuchin • droolwool • Eimi Takano • El Hooligan • Eloise Kim • Erica Borghstijn • Faunwood (Miranda Zimmerman) • Fluke • Filthbucket • Freshtoast • Gabriel Carpio • Grizlli Atom • Grumble Toy • Heath Duntz • Hiné Mizushima • Horible Adorables • HungryGhost • HX Studio • Jason Limon • Lapka (Claymate Creatures) • Jaykishen • JeAA • Jeff Lamm • Jenn & Tony Bot • Jeremiah Ketner • Jfury • Jim McKenise • Joe Scarano • Joshua Ben Longo • Juan Muniz • Kkamoxo • Kaori Hinata • Katie Gamb • Kelly Denato • Kyle Kirwan • Lee’s Menagerie • Lisa Rae Hansen • Mark Nagata • Martina Marzullo • Melissa Sue Stanley • Melodreama • Michael Skattum • Mike Strick • Misfit Menagerie • Miss Little Zombie • MJ Hsu • Mr. Mitote • Nugglife • Nympheas Dolls • OEOTOYS • One Eyed Girl • Otto Bjornik • Quiccs • Rampage Toys • Sabrina Elliott • Sad Salesman • SaoZen • Scarecrowoven • Secret Demon Services • Seymour • Shing Yin Khor • Siames Escalante • Stacia Murphy • Steve Ferrera • Stitch of Whimsy • Tasha Zimlich • Task One • The 3D Hero • The Beast Peddler. • Tim Clarke • Tokyo Jesus • Tony Kern • Triplikid • Twee Muizen • TwistyBitz • Valency Genis • Venetta Butcher • Vini Chav • Wetworks • Yetis and Friends • Yu Maeda • Zard Apuya • Zoë Williams & More……. Heres a little sneak peek. WHEN: The opening reception will take place on Saturday, Dec 9th, 2017 (as part of Beacon’s Second Saturday art walk) and all pieces will remain on display until Friday, Jan 5th, 2018, unless purchased. Pieces made for this exhibition will be available for sale both at our physical location in downtown Beacon, NY and on Clutter website www.cluttergallery.com. Some come along, check out the amazing pieces on display, and sip some festive cheer from Clutter friends at Lagunitas! Don’t forget to follow the hashtag #giftwrapped2017 and #cluttergallery for artist work in progress images.